Inventory management is one of the toughest business activity for small and growing businesses. Not only do you need to physically care for the stuff, but you also have to make sure that you don’t run out of some items or have too much of some other items. Tally provides outstanding features that make inventory management a lot easy. With not too much effort, you can probably get your inventory management system up and running. As you record sales and purchases, Tally will keep track of your inventory, just as the point-of-sale system at the supermarket does when it scan items. 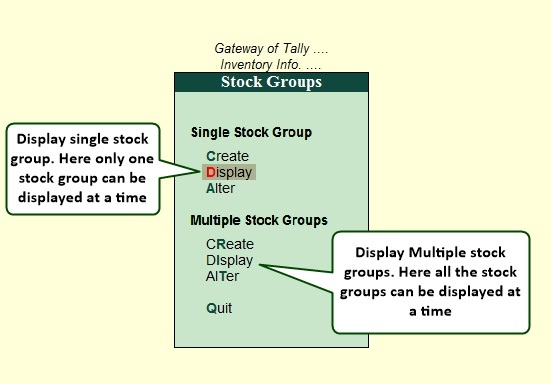 In this Tally Tutorials, you’ll learn how to maintain inventory in Tally using inventory masters such as stock categories, stock groups, and stock items. 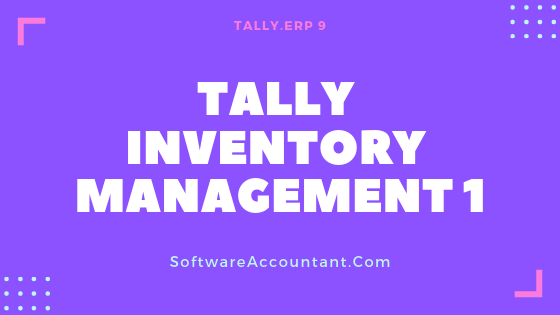 Before you can track your inventory, first, of course, you need to tell Tally that you want to track inventory by enabling the inventory features. 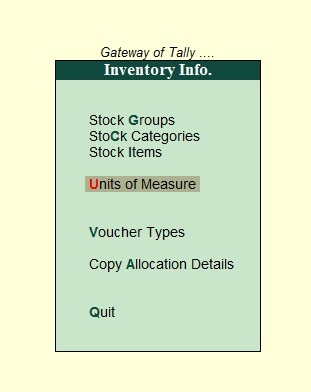 By default, most settings in Tally pertaining to inventory are set to No. You, therefore, have to set them to Yes before you can be able to work with Tally inventory features. 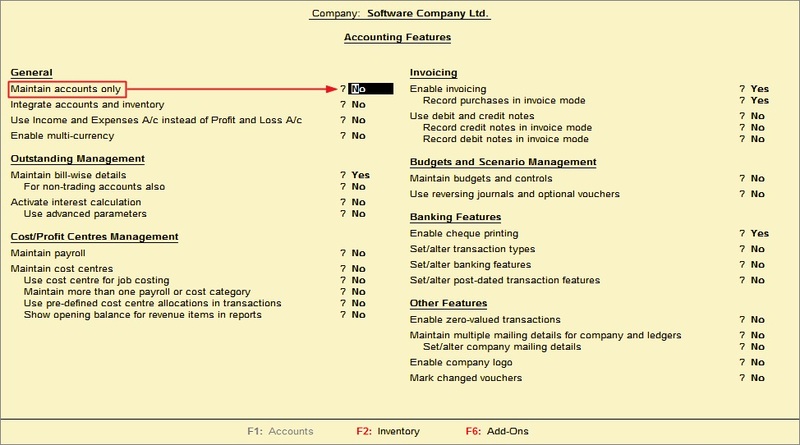 Whilst in the Gateway of Tally window, press F12 or click F12: Configure to display the Company Features menu. As seen in the above picture, under the General Category, set Maintain accounts only to No and press Ctrl+A to save the settings. You should now be able to see the Inventory Info. option from the Gateway of Tally under Masters. This menu contains items called Inventory Masters which collectively makes inventory management a lot simple. These items include Stock Groups, Stock Categories, Stock Items, Units of measure, Voucher Types, and Copy Allocation Details. But for beginners, our main focus will be on the first four items, Groups, Categories, Items, and units of Measure. Lets now look at these inventory masters one after the other to get them all clarified. Stock groups in Inventory masters are similar to that of Accounting masters. Groups are very helpful when it comes to classifying stock items. It enables you to locate stock items easily and report their details in statements. With Tally stock groups, you can group stock items base on some common features such as the product type, the product brand, etc. Thus, the above group structure can help you to locate items easily as well as produce reports on each of the groups, such as reports on Laptop computers or report on Desktop computers. To illustrate this very well, we’ll create a stock group called Lenovo Computers using the single stock group creation option. Name: Provide the name of the stock group you are creating. Example Lenovo Computers. Alias: Enter another name for this group apart from the name you provide under the name field. You can use a numerical code for the alias name for easy access. This field is optional though. Under: The under field let you specify whether to create a primary group or a sub-group under another group. While in the Under field, if you want to make the group a sub-group under another group, say Computers, which doesn’t exist in the List of Groups, you can press Alt+C to create a parent group. Should Quantities of items be added? : This field is concern about the units of measurements for the items you will place under this group. All items to be placed under a particular group should have the same measurement units before their quantities can be added. For example, you cannot add quantities in litres to quantities in kgs. Thus, if the stock items that will fall under the group have different units of measurements, then quantities of items should not be added. NOTE: If you specify Primary when filling the Under field, it means that you are creating a main group. But if you specify another group in the Under field, then you are creating a sub-group. Maybe you have more than one stock groups you need to create. 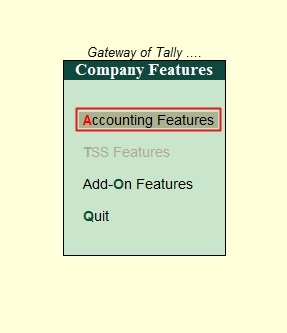 Tally lets you create several stock groups all in one window. Under Group: Specifying this field depends on the stock groups you are about to create. Are they main groups or sub-groups? And if they are sub-groups, are they under the same group? Or does each one of them fall under the different group of its own? If they are all main groups or sub-groups but fall under different parent groups, then All Items should be chosen as it allows you the option to select different groups for different stocks. If they are not main groups but fall under one group as sub-groups, then the group they all fall under should be selected in the Under Group field. In our case, we want to create all the three groups under Primary. Thus we need to select All Items to enable us the option to specify the group. S.No. : This is serial number column which is generated automatically. Thus, you don’t need to specify the serial number. Tally will not even give you the chance. Name of Stock Group: This is the column to list the names of the stock groups you wish to create. As you can see, you don’t have the option to give a second (or Alias) name for your stock group under the multiple stock group creation section. However, you can do that by altering the ledger under single ledger. Under: This column depends on what you select in the under group field at the initial stage. If you select All items, it means you didn’t specify any parent group for your stock group, Tally will, therefore, allow you the chance to do so. But if you already select a group in the Under Group field, that group will be used as the parent group for all the stock groups and will be entered automatically for you in the Under column. You can also create new parent Stock Groups from this field by pressing Alt+C simultaneously on your keyboard. Should Quantities of Items be Added: This option has been explained under the single ledger creation. This option is concern about the units of measurements for the items you will place under this group. All items to be placed under a particular group should have the same measurement units before their quantities can be added. This way, you can know the total number of items under Dell Computers, HP Computers or Acer Computers. For example, you cannot add quantities in litres to quantities in kgs. Thus, if the stock items that will fall under the group have different units of measurements, then quantities of items should not be added and can be set to NO. But if they have the same measuring units, this option may be set to Yes. After providing all the relevant details, press Ctrl+A to finalize the multiple ledger creation. After the stock groups have been created, you may need to peek at all the stock groups to check for accuracy and maybe make some changes to some of them. 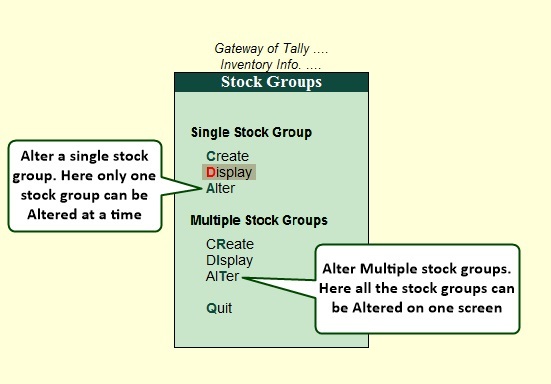 Tally can help with that as it allows you the option to Display and Alter stock groups, both under Single and Multiple options. Note: you cannot make changes to stock groups whilst in the display mode. To make any changes you need to use the Alter feature. After making all the necessary alteration to the Stock Groups, press Ctrl+A to save the changes. If the Stock group is not used by any sub-group or stock items. Thus to delete a stock group, first, of course, delete the stock items and subgroups that fall under that group. After deleting the stock items and subgroups, go to the alteration page of that group. Whilst in the alteration mode for that particular stock group, press Alt+D. Tally will prompt you for confirmation to delete the stock group. Once you accept to delete, it will be deleted completely forever. My attempt to explain the concepts into details has called for a lengthy tutorial. That’s why I need to break this article into several parts. In the next parts of this guide, you’ll learn how to manage stock units of measurement, stock categories, and stock items.